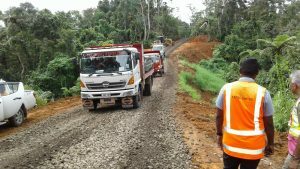 An alternative access route is being constructed connecting Bau Tikina Road off the Kings Road to Ratu Mara Road in Raralevu following a large slip at Kasavu/Baulevu Road Junction after TD04F. Confirming this, Fiji Roads Authority Chief Executive Officer John Hutchinson says the Kasavu slip was triggered by the heavy rain and had taken a great portion of the road. Mr Hutchinson said the alternative route has now been connected, as they had 30 trucks supplying gravel from two quarries over the Christmas holidays, however gravelling and remedial works on the new section is still in progress. He said they wanted to ensure that the roads in the vicinity leading to the detour is well maintained and capable to withstand potential higher volumes and loading of traffic exchange. In the meantime, Mr Hutchinson has advised the motorists to be cautious, allow extra time for their journey and drive within the speed limits.